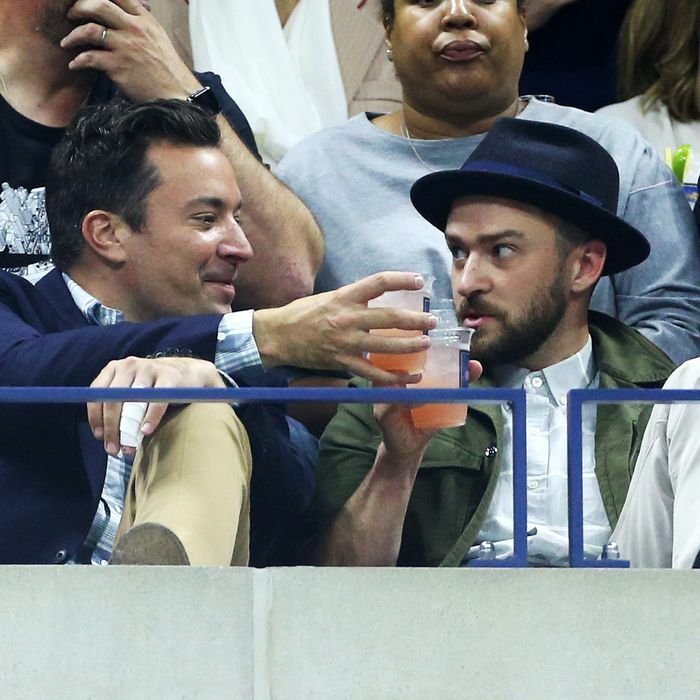 The U.S. Open, which begins today, is one of the truly great New York City events. Even if you don’t pay attention to tennis during the rest of the year, the energy of this tournament, with its excellent late-night matches and celebrity-packed seats, is hard to ignore. 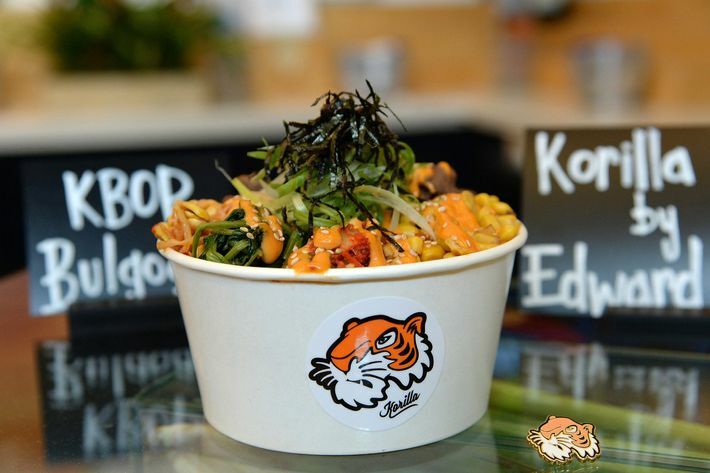 And if you’re heading out to the USTA Tennis Center in Queens to check it out, you’re going to want to eat something, not only because tournament organizers tend to offer excellent, unique concessions — Fuku! — but because the area surrounding the tennis center offers some of the most interesting and affordable food in the entire city. Here are 17 things you should try while you’re out there. David Chang is a new arrival to the tournament this year, and he’s bringing his fried-chicken sandwiches with him. 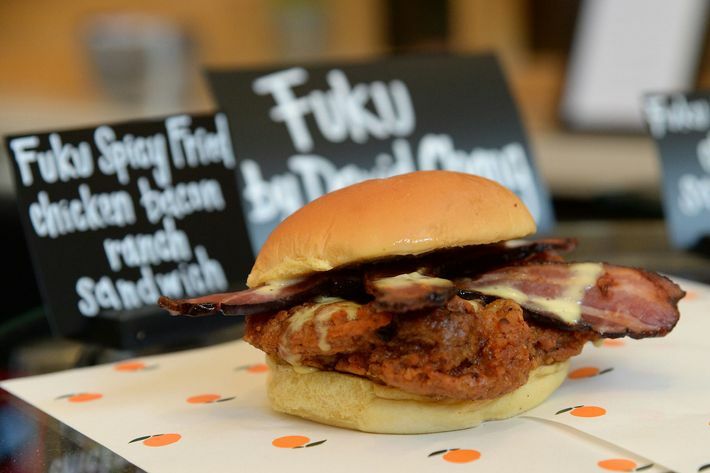 A classic Fuku sandwich, with pickles on a Martin’s potato roll, will be available, as will an exclusive version topped with applewood-smoked bacon and Fuku ranch. It’s called the McEnroe, of course, in honor of the Johnny Mac poster that hangs in Chang’s Ssäm Bar. Perhaps the most interesting item in the entire concession is this portion of purple rice loaded up with caramelized kimchi, bean sprouts, roasted corn, garlic spinach, and shards of marinated rib eye. There’s also creamy chipotle and gochujang chile sauce that binds everything together and adds some welcome heat. Mantuano, chef of Chicago’s Spiaggia, returns to the Open, and this year he has some upgraded cooking digs, which means he can offer this pasta dish, cooked on the spot, with guanciale, Pecorino-Romano cheese, and San Marzano tomato sauce. To wash down that penne: Mantuano offers glasses of deep-pink Vidal-Fleury Côtes du Rhône that are basically perfect for drinking outside in late August and early September. A very welcome new concession, which will shuck Cowboy oysters from the West Coast, as well as local Long Island Blue Points. Ken Oringer is opening a pop-up version of his blockbuster tapas spot (the stand-alones, of course, are in Boston and Chelsea). Most menu items will make the trip to the Open, and this tempura-crusted crab will be a tournament exclusive. Pumping up the umami: Alioli laced with ramen flavor packs. Oringer says the dish is an homage to classic Thai drinking snacks. Moët & Chandon remains the event’s official Champagne sponsor, but the Segura Viudas Heredad Reserva Brut Cava — a bright sparkling wine from Spain — is the bubbly you’ll really want to try. If you’re in the mood for a cocktail, try this Spanish riff on a classic Moscow Mule. It’s a combination of ginger beer, lime, Hendrick’s gin, and manzanilla sherry. Check out this pizza stand, where the ingredients are all organic, the dough is shipped in from Italy, and the pies are fired in a rotating coal-burning oven for an even char. There’s a classic margherita made with fresh mozzarella and Parmigiano-Reggiano, as well as a diavolo that’s topped with jalapeños, spicy sopressata, and Mike’s hot honey. This is one of those dishes that lingers in the mind and guarantees customers return to Flushing to get another fix. It’s a simple concept: in-shell crab, slightly sticky rice, and thinly sliced green onion. Simple and luxurious. Leave yourself extra time if you’re trying to catch a match as there is often a wait for a table. The spiced lamb is the signature dish at this northern Chinese favorite. But don’t skip the dessert, of which there’s really only one (unforgettable) option: chunks of apple, taro, and sweet potato in hot, sticky caramel. Pull everything apart with chopsticks, then dunk the segments into cold water, which hardens the sugar and creates an instant candy coating. The simple name doesn’t necessarily do this dish justice, though it’s extremely accurate: A disposable plate with a dozen soft pork-stuffed dumplings with a slow-burning, smoky chile oil. It’d be easy to miss this simple storefront, were it not for the massive, pineapple-topped rotisserie outside, slowly turning onion-and-tomato-marinated pork, which is sliced off, placed on homemade tortillas, and presented with radishes, onion, and lime. Just about the most perfect taco experience you can have in New York, or anywhere else for that matter. Within walking distance of the Tennis Center, you can find chicken, lamb, beef, and sausage skewers grilled directly over charcoal — for $1.50 each. If you really want to splurge, a whole quail will run you $4. This well-loved shop’s tacos are notable, but the soft, spongy tamales are the real order. Filled with roasted chiles and Oaxacan cheese, spicy chipotle chicken, or pulled pork, everything stays perfectly juicy in the corn-husk wrappers. On the side: housemade charred-jalapeño-and-green-tomato salsa that’s tart, smoky, and definitely habit-forming. No trip to Corona is complete without a trip to this historic kiosk. The original lemon flavor is basically a rite of passage, but there are nearly 50 options, including melon, tangerine, and watermelon. The boldest order: peanut butter, which is somehow simultaneously icy and creamy. A true feat of frozen-flavor engineering.